Bringing up-to-date Joel Spring’s ongoing documentation and analysis of political agendas for education in the US, the fourth edition of Political Agendas for Education focuses on the Republican and Democratic parties in the 2008 national election and post-2008 election era. In order to consider the similarities and differences in the evolution of the Republican and Democratic education agendas, this edition includes updated and new chapters on the Democratic education agenda, and updated discussions of the Republican education agenda. 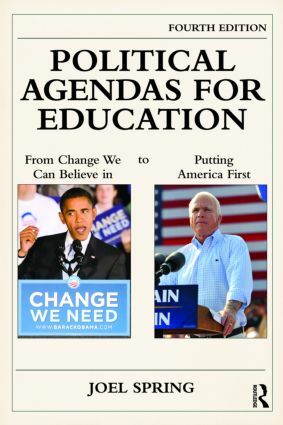 includes a completely new chapter on "Teacher Agendas: Republicans and Democrats"
shows how the education agendas from the 2008 campaign of John McCain and Sarah Palin are compatible with previous Republican desires to protect socially conservative values in schools. Political Agendas for Education is essential reading for courses dealing with the politics of education, foundations of education, educational leadership, and curriculum studies, and for educational scholars, professionals, policymakers, and all those concerned with the politics of education in the U.S. and its consequences for schools and society.